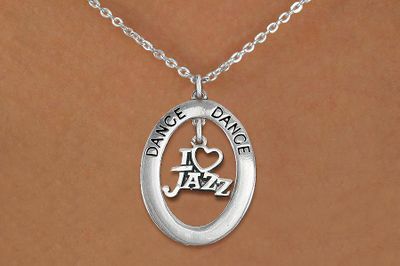 WITH SILVER TONE "I LOVE JAZZ"
Exclusively Ours! Lead & Nickel Free!! Antiqued Silver Tone "DANCE" Open Oval Charm Holds A Detailed Silver Tone "I Love Jazz" Charm, And Comes On A Lobster Clasp Chain Link Necklace.